Originating in their native land's harsh terrain, Scottish cattle breeds share tough constitutions, longevity and the ability to thrive under less than ideal conditions. These qualities make them desirable for ranchers and farmers all over the world. Scottish cattle also impart their vigor when crossed with other breeds. Also known as Aberdeen Angus, these beef cows are born polled, or hornless. 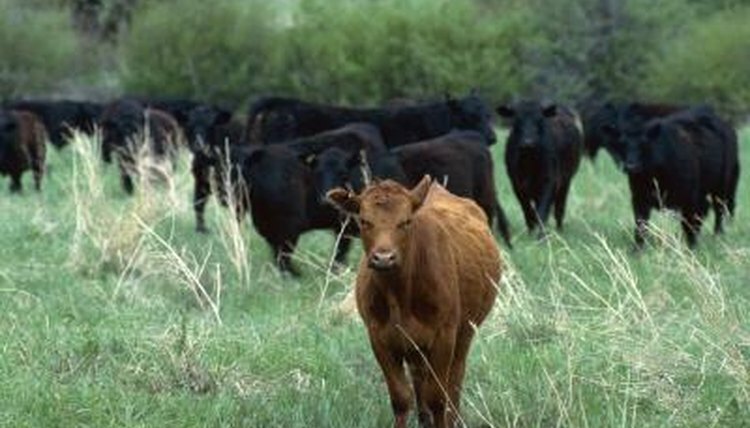 While most Angus are black, occasional red specimens crop up. It's one of the top beef breeds in the world, not only due to the quality of the meat but because Angus do well on less feed than comparable breeds. This red and white dairy breed was once renowned for its foot-long, curved horns. Most modern Ayrshires are polled soon after birth, as those long horns aren't practical in today's dairy industry. Like other Scottish breeds, Ayrshires are hardy and adapt well to tough climates and pasture conditions. According to Oklahoma State University, top producing Ayrshires cows "regularly exceed 20,000 pounds of milk in their lactations," annually. While naturally polled Galloway beef cattle appear in various colors, the belted Galloway is perhaps the best-known. A white band, or belt, encircles the back and abdomen. Other colors include black, red and dun -- light-colored animals with dark legs and tail. Galloway cows are known for easy calving and exceptional maternal qualities. Galloways grow shaggy winter coats, so they're especially suitable for cold climates. The breed produces exceptionally high-quality meat. You won't mistake a Scottish Highland cow for any other breed. She has a long, shaggy coat and enormous, upward-sweeping horns. While most Highland cattle are light red, other colors include black, red and white, dun, cream and brindle. This beef breed, renowned for its hardiness, does well in harsh climates and forages efficiently. The American Livestock Breed Conservancy states that "Highlands consume a wide variety of pest plants as well as grass and can be used to improve pastures," making them a favorite of organic farmers. The rare red polled Luing, a breed established in the 1950s, is a cross between the Highland and shorthorn. Through extensive line-breeding, or breeding between animals that are related but not actual siblings or parent/offspring, the Luing breeds true to type. It's considered an actual breed rather than a cross. Exceptionally fertile, Luing cows are known for the ability to rear healthy offspring even in difficult climates. Like other Shetland Islands-bred animals -- such as ponies and sheepdogs -- Shetland cattle were originally much smaller than native mainland breeds. This relatively rare dairy breed known for its longevity has been crossed with other cattle since the 19th century. This results in many black and white cattle in what had been a predominantly red and white breed. Modern Shetland cows now average about 41 inches tall at the shoulder, still small but larger than their ancestors. Shetland cattle are listed with Britain's Rare Breed Survival Trust. Once known as the Durham, the shorthorn is either red, white or a combination of the two, a blend of white and red hairs called roan. Formerly used for both milk and meat, today's shorthorn is used primarily for meat production, although dairy strains exist. Crossing with shorthorns has influenced the development of many breeds worldwide. The shorthorn boasts one of the oldest registered cattle herd books, dating back to 1822.